Ellu Podi(Sesame seeds chutney powder) is a healthy and nutritious chutney that can be prepared without much efforts and can be kept ready at hand to be served with idli/dosas.I had never tasted this before(though heard lots about it) until I made.This podi is very flavorful and highly beneficial.They are considered to be the world's healthiest foods with low glycemic index.The seeds are very valuable source of protein that provide the essential amino acids that are essential for growth especially in children.They are an important source of phyto nutrients such ad omega 6 fatty acids,vitamins(B complex vitamins), minerals(calcium,iron,maganese,zinc,magnesium,selenium) and dietary fiber with potent anti cancer as well as health promoting properties.Niacin is also abundantly found in these seeds which are required to reduce the LDL cholesterol(bad) levels in blood.They also provide about 25% of the daily requirement of folic acid which when given to expectant mothers reduces the chance of neural tube defects in newborn.I think this short para on the health benefits of these tiny seeds has enlightened you and so what's next.Go ahead and give this a try !! Leave the skin on the garlic,add this to a heated pan. Keep stirring on medium heat until the skin turns slightly browned.Switch off flame,peel the skin and use. In the same pan,add the sesame seeds separately and dry roast until it pops & slightly browned.Leave in a plate. Add about 1/2 tsp of oil,fry the red dry chillies and chana dal.Drain and leave aside. Let everything cool a bit,transfer the contents(sesame seeds,garlic,red dry chillies,chana dal,asafoetida & salt) to a blender and grind 3/4th done. Transfer to a clean moisture free bottle and store.Serve with idlis/dosas by mixing the ellu podi with sesame oil. * Don't let the sesame seeds brown up,the taste may not be good. * It is not required to use both color sesame seeds,you can use either of the sesame seeds too. * The chillies I used were very spicy so used only two.You can use chillies as per spice tolerance and depending on the chillies used.The color of the chutney powder may vary as per the chilly. I really like the first pic. 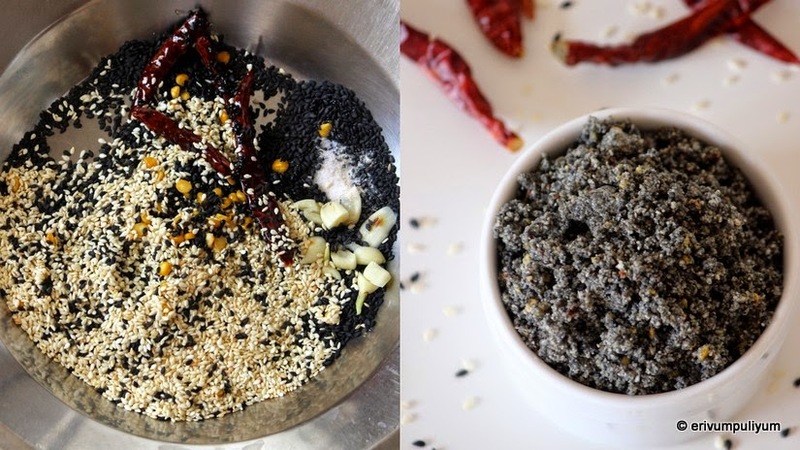 Ellu podi is in my to do list since long now that u have given the recipe and enlightening on benefits I need to try it soon. healthy and flavorful podi for idli and dosa..